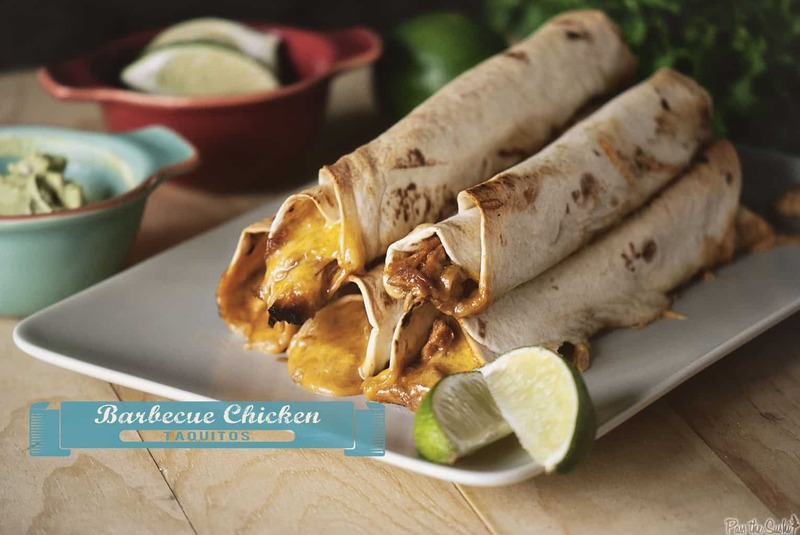 BBQ Chicken Taquitos; oozing with barbecue chicken and cheese. You won’t be able to stop snacking on this new favorite. This month the Pass the Cook Book Club picked up Jenny’s cookbook, the Picky Palate, named after her awesome blog. The club is designed to have us use the books collecting dust in our ever growing collection (any one can join!) and this month, keeping with spring flavors and wanting a burst of bright in the rotation after Guy’s big manly meals last month, I chose three recipes that I thought would be a lot of fun. There were the Shrimp Mango Quesadillas, Weeknight Chicken Taquitos, and uber cute sounding Peanut Butter and Jelly Mini Pies. Each of these was family approved but with a slight twist and it was great reading about who wanted to try what as the month went on. I opted for the taquitos because things have been crazy busy here and I knew sneaking shrimp in was not going to fly, though Erin’s suggestion of using chicken instead would have worked perfectly. To join the club, click for our facebook group here. Remember, you don’t need a blog – you just need to want to cook! We pick recipes and post once a month. If you can’t one month, no bigs. If you want to try more than one recipe – go for it! We are just in this to have fun. If you’ve tried this Barbecue Chicken Taquitos recipe or any other recipe on passthesushi.com please don’t forget to rate the recipe and let me know where you found it in the comments below. I love hearing from you! You can also follow along for more good eats and travel tips on Instagram @passthesushi & @girlcarnivore, Twitter & Facebook. Preheat the oven to 400 degrees. Line a baking dish with aluminum foil and spray with non-stick cooking spray. In a skillet over medium heat, heat the olive oil until shimmering. Add the onion and pepper and cook until tender, about 5 minutes. Stir in the chicken and cook until warmed through. Add ¼ cup of the chicken filling to the center of each tortilla and top with 2 tbs cheddar cheese. Roll tightly and place seam side down in prepared baking sheet. Repeat with remaining tortillas. Bake for 25 to 30 minutes or until tortillas are crispy. 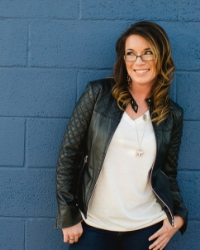 Visit all the great blogs participating in this months cook book club! LOVE THESE!! My family would go crazy gor these. Making them as fast as i can! I can’t wait to join in next month! I love all three of the choices from this month. I want nothing more than to reach through the screen and grab a taquito for breakfast. These sound awesome, and look so cheesy! Hello deliciousness in my face! You really should try the quesadillas with chicken, they were AMAZING. I love the sound of your club/group! And I love Jenny’s book and she is so sweet, on top of it! Great job on these little taquitos! You captured my heart with BBQ. And also made me drool. 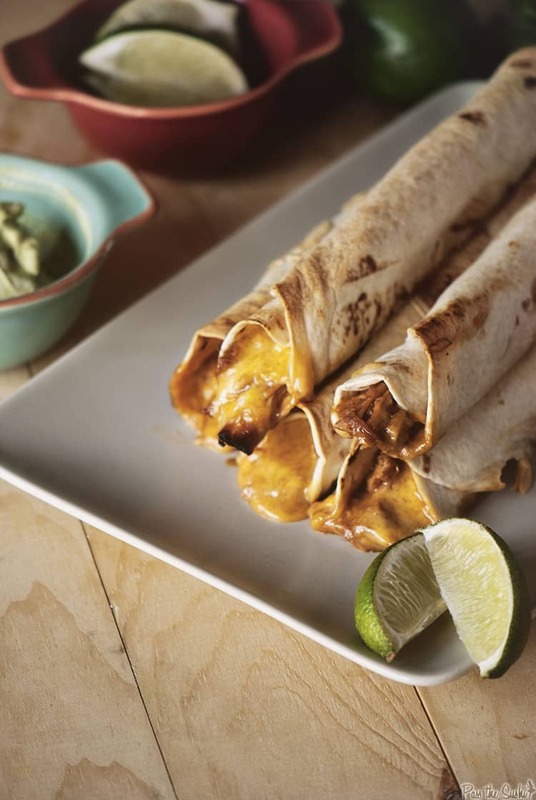 Oh yeah, look at that delicious cheese oozing from those taquitos–absolute deliciousness! Looks like none of us fried the taquitos. I am drooling all over your bbq version. My husband would think he’d died and gone to Heaven if I served these. These are rolled up and definitely ready to be devoured. BBQ taquitos sounds really good, what a great idea and not the usual. As usual your photos are making really hungry!! 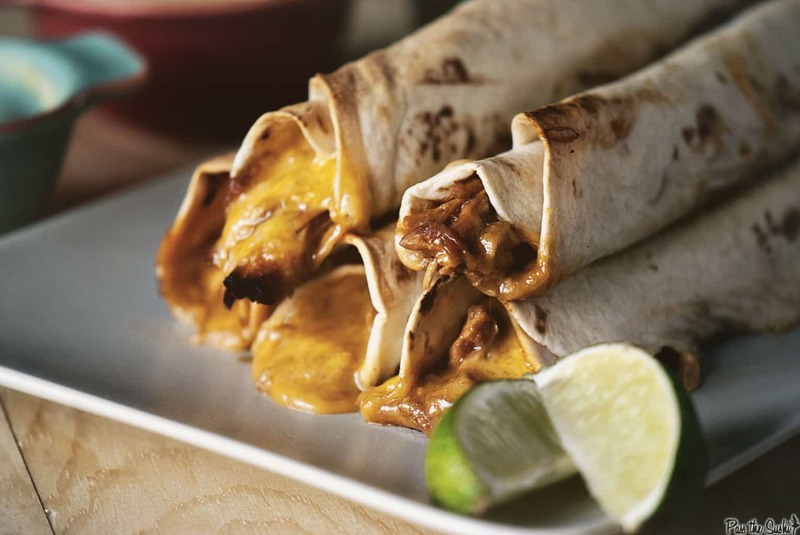 I love taquitos 🙂 this BBQ chicken recipe sounds amazing! These look SO GOOD. I am salivating on my keyboard!! I LOVE ANYTHING BARBEQUE!!! Could I have emphasized that more? These are being made next week for sure. P.S. I always love your photography Kita. How fun! I’ve made a similar version before and I absolutely LOVE it!